Solar blinds with a solar reflective coating on the window facing side and a low emissive coating on the room facing side will help to save energy in winter and in summer. The window facing side will keep the sun out even when coloured in darker colour tones. The low emissive room facing side again helps to keep the heat out in summer and it keeps the heat in the house in winter. As lots of our energy is exchanged over the windows it makes sense to improve this situation. 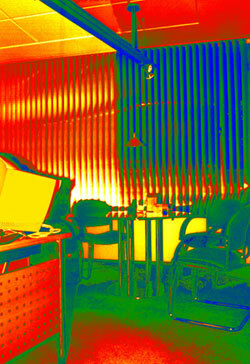 This photo taken with a thermal imaging camera shows an office where the right side of the solar blinds have been equipped with a low emissive interior side and a solar reflective coating on the window facing side for testing. 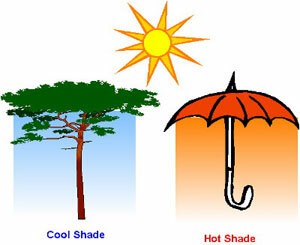 Everybody knows that a tree will give a cool shade but a umbrella will only protect from the sunlight but the shade is hot as soon as the umbrella warms up. The shade from the new solar blinds with a low emissive interior side will make a cool shade like a tree.